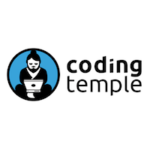 Chicago-based Coding Temple is place where one can find their niche in a short amount of time. Through an accelerated learning program, our institution provides eager applicants a chance to switch up their career and hit the ground running after completion of the program. This is the overall objective at Coding Temple: to build master programmers capable of performing at the highest level of coding at any number of employers we have at our fingertips through vast networking connections and allies. A coding novice is transformed into a Professional Jr. developer. No matter the skill level of an applicant, we’re looking for all those who desire a shift in their life, a new path to blaze, talents to learn. So for those wanting to get that leg up and come into the main course tried and tested, the bootcamp provides the perfect avenue to gather the foundational basics needed to really excel at Coding Temple. Our absolute, positively, number one goal is to provide students with all the skills and knowledge to not only land an entry-level web developer position, but for them to shine and standout among their peers.